Our boutique size allows us to show our bees a little more love than some of the bigger operators. During Autumn we check on bee numbers and make sure they’re at a good level to cope when food is limited. Winter is an important time for our bees to stay warm and healthy. 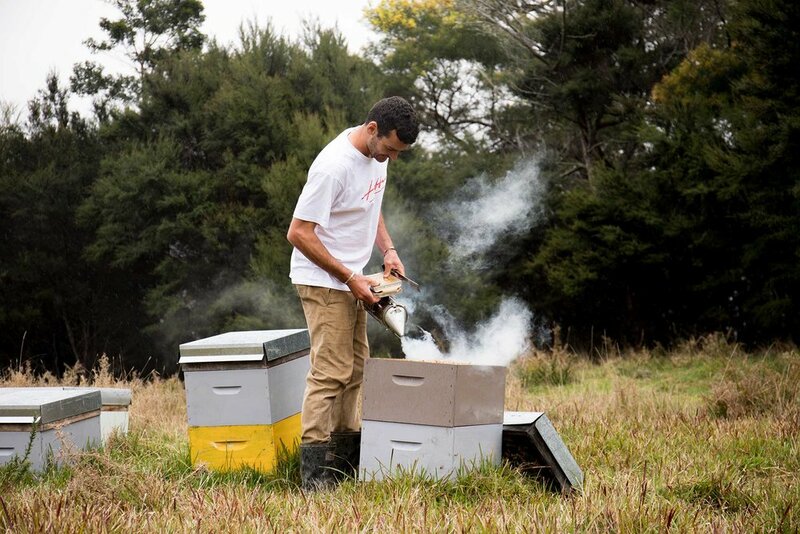 We leave some honey stores for the cooler months, and feed a pollen mix to encourage a young brood. Our wild habitat in the winterless north allows for rich, potent honey, and Spring is a busy time. Nectar is flowing and the bee numbers are up. Mānuka will flower first in the Spring and come December when the flowering slows down, we remove the first honey boxes – a strong Mānuka honey is the result. Afterwards, when everything is in flower, we add a further box on top to capture our tasty bush blend honey. At the end of Summer we split our hives and ensure enough flower is available to collect its winter stores.